For the last week I have had my head well and truly stuck in teapots. Despite being one of the few people in this country that doesn’t drink tea, it’s been fascinating. There are nearly 100 teapots in the collection, from delicate early 18th century China teapots to beautiful Victorian gothic teapots. To begin with I was just looking at them from a purely aesthetic point of view but after looking below the surface each one can tell an important story. For example, there is the early Meissen teapot decorated by Christoph Conrad Hunger who ran away to Vienna with Meissen’s secrets and helped set up a rival company. Another is a Staffordshire teapot that has the secret emblems of the Jacobite Rebellion hidden in its decoration. Even the size of teapots is interesting, the earlier they are the smaller they are reflecting the exorbitant price of tea before taxes on it were dropped. For me, what is really interesting about teapots is their role in the race to produce porcelain in Europe. Like the tea that brewed inside them, the first teapots came from China. Though silver and ceramic factories imitated their shape and decoration, it was the delicate Chinese porcelain that was most prized. Potters realised if they could match the hardness and delicacy of the Chinese teapots they could create a whole new market that could not only compete with the imports but eventually take over. Only one problem… they didn’t know how! The factory of Meissen in Germany were one of the first to discover the technique and by 1719 they had the monopoly on European porcelain. Unfortunately for Meissen (but great for the rest of Europe) unscrupulous Meissen employees sold the secrets of porcelain and rival factories were started up. In England, it wasn’t until the 1740s that several factories succeeded in producing porcelain, but it took many years of experimenting with different materials to produce a porcelain that could cope with hot water as well as its Chinese equivalents. One result of the inability to produce porcelain in England was that if an Englishman wanted his coat of arms painted on a tea set he would have to have it done in China and then sent back to England. 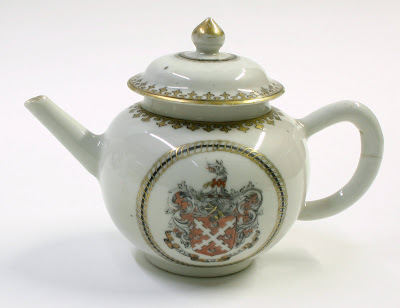 Which brings me to this week’s object of the week, an armorial teapot from about 1760. Though on first glance you might be thinking “out of the 100 teapots in CHAG’s collections surely there is a more beautiful one than this?” You would be right. I could have shown you the gilded teapot shaped as a Roman soldier holding a dolphin or a fantastical teapot shaped like a monkey. But this particular teapot has had me playing detective, and I still haven’t found all the answers. If you look closely at the motto below the arms it reads ‘LOYAL AU MOAT’. This was my first mystery, try as I might I could not find a coat of arms for a family that was ‘loyal until a deep water filled ditch that surrounds a castle’ which made me think the motto was wrong. This isn’t unusual with armorial china. When an image of a family’s coat of arms was sent to China important details could be lost in translation. Here, the ‘A’ in moat should be the ‘R’ of mort. The inscription would then read ‘Loyal until Death’ – the family motto of Michael Barnwell. So who was Michael Barnwell? This is where it gets more interesting. A little research revealed that Michael Barnwell worked for the East India Company and died in 1792. The East India Company had had the monopoly on all trade between Britain and Asia since 1600. From 1678 tea became one of its most profitable cargo, and with the tea came porcelain, which acted as ballast for the light load. So Michael Barnwell’s teapot not only illustrates China’s prowess in porcelain production and the trade in armorial china, but is also inextricably linked to the importing of tea to Britain. Not such an ordinary teapot after all. Great stuff! Looking forward to the "Teapot" exhibition? That would be great and would automatically incorporate so more empirical history.